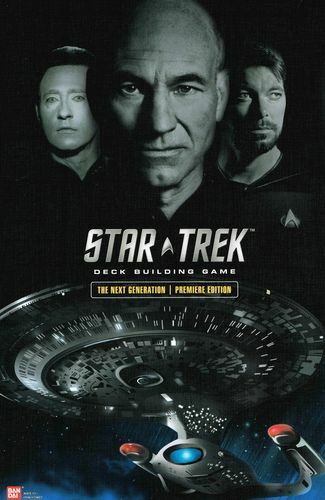 Star Trek is a deck building game with a couple of interesting twists. The most significant twist is that there are three different ways to play. The first approach is every player for themselves with the first to reach 400 points wins the game. The second approach is a partnership game called the Klingon Civil War Scenario. A special set of 25 cards are introduced into the Space Deck to facilitate this two-on-two battle. 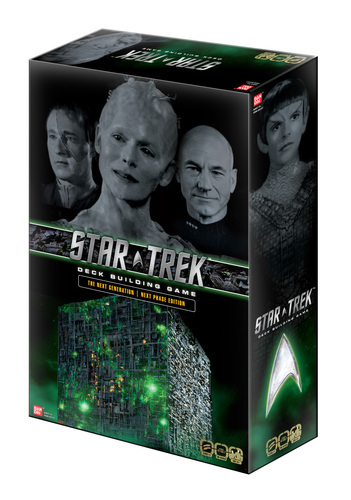 The third approach is called the Borg Invasion which utilizes 25 special cards in the Space Deck to turn the game into a cooperative game with players focused on defeating the Borg. Unlike the TV series or the movies, players start with a relatively ordinary starship and crew. Players must manage their cards to build an all-star cast of characters from The Next Generation. Player can use diplomacy to gain a faster and a more powerful starship, or they can just decide to fight and defeat those other ships to collect the points. In any case there are missions to be accomplished, events to defeat, and battles to be won. Some battles involve ships encountered in space, some involve other players but all lead to the final frontier and victory among the stars. Additional Release: (2012) Star Trek: The Next Generation: The Next Phase. This game can be played as a stand-alone or combined with The Premier Edition.